The SSEP Mission 6 to ISS Yankee Clipper II payload of student experiments is set to return to Earth today aboard the SpaceX-5 Dragon spacecraft, the same vehicle that brought it to ISS on January 12, 2015. The fifth and final Crew Interactions with the Mission 6 experiments were carried out on February 8, 2015, at 6:55 am EST, by ISS Commander Barry Wilmore. The interactions included de-activation of 7 of the 17 experiments. Yankee Clipper II was then moved from ISS to Dragon in preparation for unberth today. All Yankee Clipper II student flight teams will be standing by for receipt of their flight experiments, harvesting, and analysis. NCESSE will be conducting a pre-harvesting inspection of the mini-labs with all teams. You are invited to watch the unberth at ISS LIVE on NASA TV in the video portal below. NASA will be starting live coverage at 1:45 pm EST. Also below is the NASA February 4, 2015, press release on Dragon’s return to Earth, which includes details of live coverage. After delivering more than 5,000 pounds of supplies and experiments to the International Space Station last month, the SpaceX Dragon cargo spacecraft is set to leave the orbiting laboratory on Tuesday, Feb. 10. 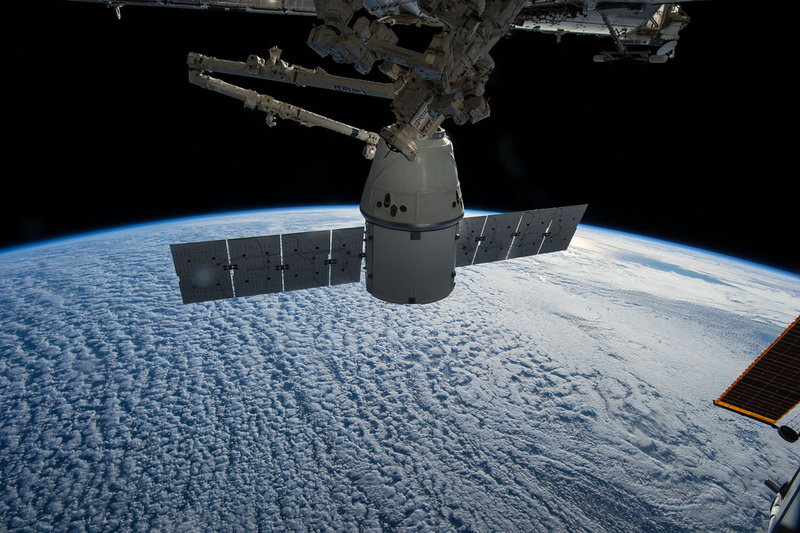 NASA Television will provide live coverage of Dragon’s departure beginning at 1:45 p.m. EST. The Dragon spacecraft is scheduled to detach from the Earth-facing side of the station’s Harmony module and release through commands sent by ground controllers in mission control at NASA’s Johnson Space Center in Houston operating the Canadarm 2 robotic arm. Mission control will maneuver Dragon into place for its release, which is scheduled for 2:09 p.m.
Dragon will execute three thruster firings to move a safe distance from the space station for its deorbit burn at approximately 7 p.m. The capsule will splash down in the Pacific Ocean around 7:44 p.m. The deorbit burn and the splashdown will not air on NASA TV. In the event that weather at the landing zone does not permit a Feb. 10 departure, the next available opportunity is on Feb. 11 with a 1:17 p.m. departure time with NASA TV coverage beginning at 12:45 p.m.
Dragon currently is the only spacecraft able to return cargo from the space station to Earth. It will return about 3,700 pounds of cargo, including science samples from human physiology research, biology and biotechnology studies, physical science investigations and education activities sponsored by NASA and the Center for the Advancement of Science in Space (CASIS) in Melbourne, Florida. CASIS, a nonprofit organization, is responsible for managing research performed in the U.S. national laboratory portion of the space station. Dragon launched on the SpaceX Falcon 9 rocket from Cape Canaveral Air Force Station in Florida on Jan. 10 on the company’s fifth commercial resupply mission to the station. It arrived at the station Jan. 12.